We haven’t post much in the last few months because we have been diligently working on the new edition of Attached at the Heart, due to be released on Aug. 6, 2013. We couldn’t be more excited because it gave us the opportunity to update and add a lot of new information! Thirty years ago it was unheard of to talk about a child nursing six months let alone one year. Now we are talking about four year olds and older (not that you have to do that to be AP). So with all the criticism and misunderstanding, progress is still being made and we are so happy that API has helped in doing that. 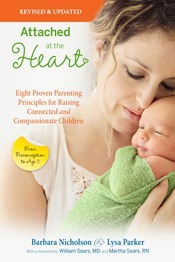 Attached at the Heart is also doing its part in clarifying, raising awareness and informing parents and professionals about best practices that are supported by a wealth of scientific studies. The truth is that attachment parenting isn’t about what you do as much as it is about an overarching understanding of what children need from us to develop into whole and happy adults and why it is so important for our future. At the heart of attachment parenting is a level of empathy and respect for our children as precious human beings; values that are uncommon in our culture among adults not to mention children. In the real world of attachment parenting, we are kind and compassionate, we respect and support each other knowing that we can make a difference in our families and in the world one generation at a time. Our revised and updated edition of Attached at Heart is coming soon! (HCI Books, Aug. 6, 2013) There’s new information that every parent and professional needs to know. You can preorder now at Amazon and Barnes & Noble online. Purchase Attached at the Heart!